“What is happiness?” For centuries, philosophers, artists, spiritual masters, religious leaders, psychologists, economists, researchers, and humans of all kinds have debated this essential question of life. On April 26, thirty-five high school students from all across Indonesia gathered in Jakarta to answer this question at the 2014 National WORDS Competition, sponsored by the American-Indonesian Exchange Foundation (AMINEF). Each student was challenged to prepare a 5-minute speech in English and creative performance duo to enlighten us on the meaning of “happiness” and to demonstrate what makes them happy. These kids were brilliant. They talked about the importance of family and community, the value of owning one’s identity, the joy of expressing oneself through art, music, and dance, the power of sharing one’s happiness with others and helping a friend, and the pride of perfecting one’s craft. They wrote and sang passionate, original songs, played guitar and piano pieces, rapped Eminem, danced with burning candles, performed love stories through puppetry, did stand-up comedy, made video compilations of happiness interviews in their communities, showed their original graffiti and artwork, told stories and folktales, and brought the house down with their incredible speeches and unique talents. More than anything, the WORDS Competition was a powerful outlet for the youth of Indonesia to give a fresh perspective on the world through their eyes and an inspiring venue for the Fulbright ETAs to hear their stories. 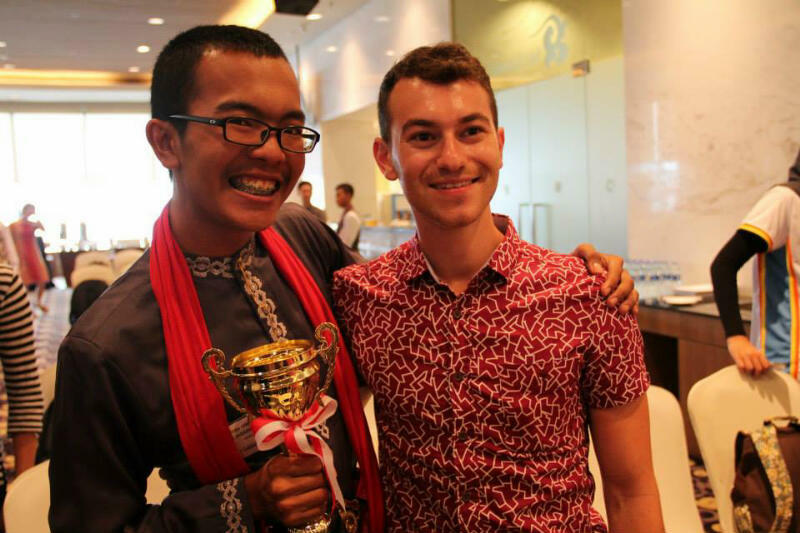 Prior to the national competition, each Fulbright ETA organized an English competition at their school to select one winner that would move to the national competition in Jakarta. They had a month to work with their student-winner, to perfect their speeches and talents, and to ready them to perform in front of a panel of judges and audience. The winner of my school’s competition was a young man named, Muhammad Al Anas. He’s an eleventh-grader at SMAN 8 Pekanbaru, and as of April 26th, the national champion of the AMINEF WORDS Competition. He’s also one of the sassiest, bravest, and most outspoken kids at my school. His WORDS presentation moved the room to tears and rounds of raucous applause. Anas and Mr. Taylor, his American English teacher, smile wide after Anas is announced the overall winner of the 2014 WORDS Competition. This kid has got skills. “For me, happiness is that amazing feeling when you have the confidence and courage to be yourself, and suddenly you can sing better than Beyoncé and dance better than Michael Jackson,” Anas said. I mean, this kid is fearless. He concluded his presentation with a captivating story about a prince who couldn’t find happiness through riches or beauty, but unlocked a world of joy through dancing and letting loose. At WORDS, Anas talked about our most difficult task: the courage to love and accept yourself for who you are. How special for a little dude to be so unapologetically himself! A lot of things make Anas’s success special to me. First of all, I’m so inspired by what he has to say and am insanely proud of his courage to speak up about taboo subjects in Indonesia. Secondly, I am encouraged by the knowledge that preparation and hard work – all of the afternoons and lunch breaks spent refining and timing his speech – are the real conduits of success. And thirdly, I am proud to know that I made a difference in his life, as a teacher and a friend. When people tried to change Anas’s speech for being too open and honest (read: controversial), he stuck to his guns and said it was important that he got the chance to present his message. His grit and charisma is contagious. Later, after the smiles and tears had settled, the trophies given out, I took Anas aside and asked him how he was feeling. About the author: Taylor Saia was a Fulbright English Teaching Grantee placed in the capital city of Pekanbaru in the Riau Province, located in Sumatra, Indonesia. He was a grantee for the 2013/2014 school year. October 23, 2014 in Features, Teaching.